There are thousands of plants you can start from seeds indoors at home, including flowers, vegetables, and herbs, but is it worth it? 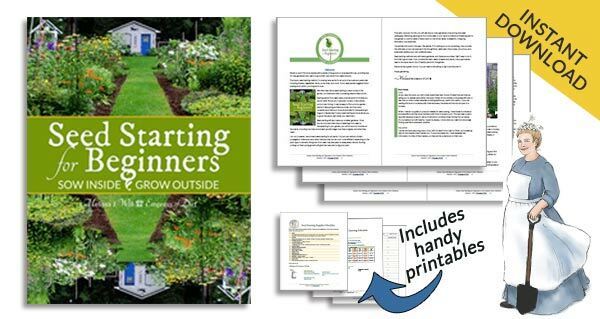 How do you decide what to start from seed and what to buy from a local garden nursery? Here’s some smart benefits to indoor seed starting, ways to narrow down your choices, and grow your best garden—and some happiness along the way. Why bother to grow plants from seed when you can buy them at the nursery? 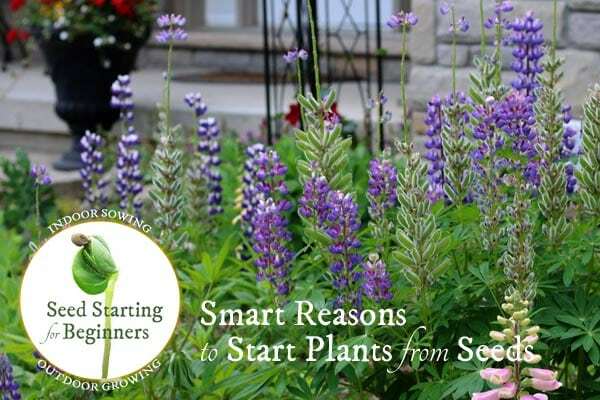 A local nursery or mail-order plant business can only provide so many options, and, with the mass consumer in mind (not a criticism, they need to earn money), they may rarely step beyond a handful of predictable plant choices. With indoor seed sowing, you’ve got thousands of seeds to choose from in a multitude of seed catalogues. Really, it comes down to, not what shall I grow? But how will I narrow down the list! Here’s some of the main benefits. If you live in a cold climate, there are only so many days between last frost in spring and first frost in autumn. That can be a narrow window of time to grow plants to maturity, either for fruit or flowers. To get around this, you can either buy starter plants or ‘transplants’ as they are often called, or you can grow your own at home. Either way, this gives us a jump start on the main growing season. Warmth-loving plants like tomatoes, eggplants, and peppers, are good choices for indoor seed starting. Depending on the variety, they may need several months to reach maturity, and starting them indoors avoids mishaps with unpredictable or cold spring weather. Slow-growing cool crops like broccoli and Brussels sprouts are excellent candidates as well. These guys are need a lot of time from seed to harvest and don’t mind being transplanted. Besides food crops, I grow dozens of flowering perennial plants each year from seed as well. That’s how I’ve managed to cram my garden full of plants in just a few years. But not all seeds are suitable for indoor starting. Some plants grow best with direct sowing outdoors. I direct sow things like radish, beans, peas, corn, squash, and cucumbers. Indoor seed sowing space is limited, so I try to stick to things that have the most value to me. One major drawback with relying on a local nursery to provide starter plants is lack of variety. They are under pressure to provide what they think will sell. But are these the plants that you want to grow? With so many veggie seeds available, with unique flavours and characteristics, why not try some new ones each year? My gardening addiction is flowering perennials. Seed catalogues and seed swaps are excellent for discovering unusual plants that are not mass produced. Seed starting gives you options. Thousands of options! Maybe you want to test out heirloom veggies your grandparents used to grow. Or, grow a multitude of flowers you can never find at the nursery. Along with my (un)usual favorites, I always add a few experimental plantings in each year too. Sometimes, seed starting is all about saving money. I love the new varieties of coneflowers (Echinacea), but the transplants at the plant nurseries are pricey. The seeds aren’t dirt cheap, but I can get about 10 plants from seed for the cost of one transplant, so that’s a good deal. Yes, the new plants are small, but, it just takes about 3 years for perennials to really fill out. 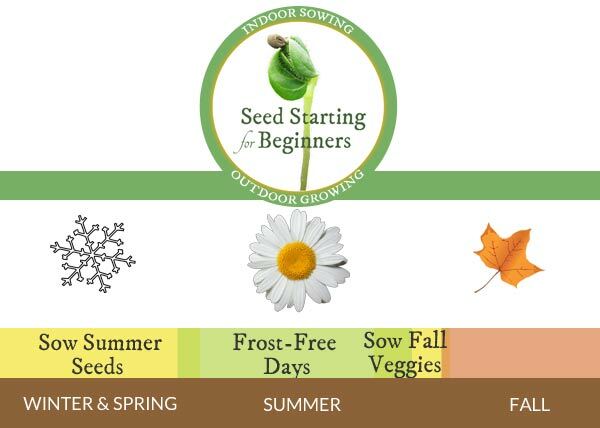 If you like to grow continuously from spring to fall, seed starting fills the gaps all the way along. Here, a lot of our local nurseries stop selling plants by July. That leaves me high and dry for starter plants for the fall / winter veggie garden. To get around this, I direct sow things like leafy greens, in shady gaps in the garden all season long, and start plants like brassicas (broccoli, Brussels sprouts…) indoors in the summer. This way, the seedlings won’t bolt or dry out in the summer heat, and I have plenty of plants ready for the fall garden. If you choose open-pollinated seeds, and take precautions to prevent cross-pollination (by spreading them out in the garden), you can begin the tradition of saving seeds for future years. Cross-pollination is not a concern for self-pollinating varieties like beans and tomatoes. Your seed packets should provide more info on this. Hybrid seeds can provide tremendous benefits (variety, disease resistance, and vigor) but they are generally not suitable for seed saving as the saved seeds to not produce plants true to the parents. I should also mention that some newer seeds are patented, and seed saving is not permitted by law. You’ll see this noted on the packet if applicable. You can read more about the different types of seeds (open-pollinated, heirlooms, and hybrids) here. I never anticipated this one when I started growing from seed, but it could be the most important one. Indoor growing is a huge antidote to the winter blues. I remember vividly the first year I had my full indoor seed-starting setup. After a week or two I realized that the daily task of checking the seedlings, watering, taking some progress notes, and repotting plants was giving me that same hard-t0-describe happiness that I get from outdoor gardening. Houseplants can do this too, but there’s something about the whole seed starting process, including that slightly earthy smell of growing plants, that really taps into it. This alone makes it worthwhile. Just because you can grow plants from seed, doesn’t mean it’s the best choice. 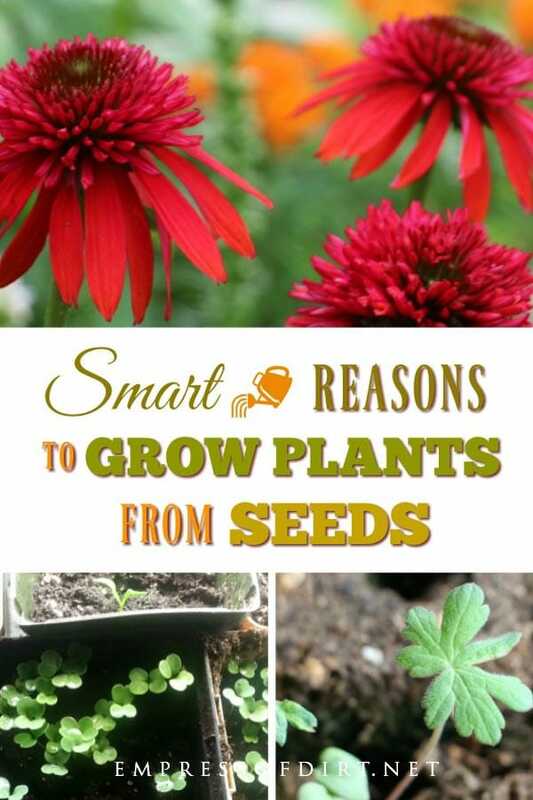 There are many ways to propagate plants, and seeds are just one way. Sometimes, other methods like growing plants from cuttings are much more efficient and successful. 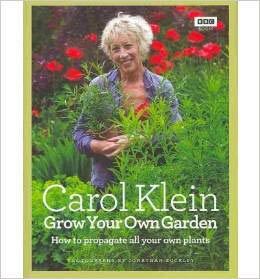 If you’ve caught the plant growing bug, I’d suggest getting a good book on propagation (this article on garden guru Carol Klein shows one of my top picks), and tries things out. 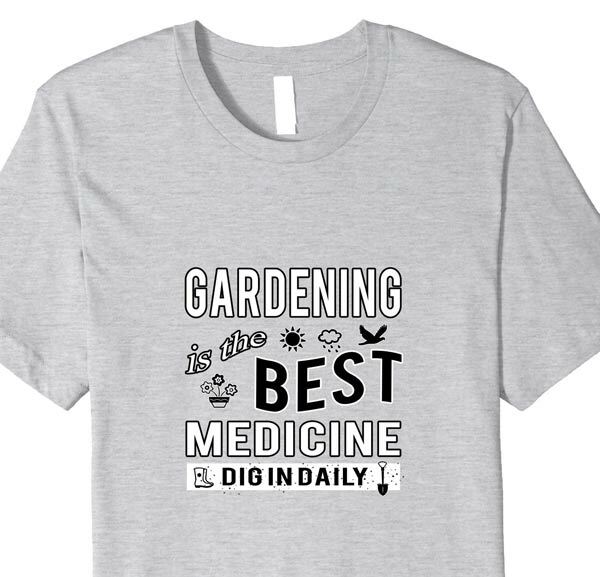 It’s a fascinating world and a great way to fill your garden with free plants. Starting plants from seeds indoors allows us more options with better variety, the opportunity to try rare or unusual seeds, saves money (sometimes, not always), and increase the garden happiness quota. Indoor growing space is limited, and your seedlings will need more room as they grow, so choose carefully. Decide what has the most value for you? You may choose plants that are not available at your local garden nursery, or, are too costly as starter plants. Also check that the required days to maturity (listed on the seed packet) fits your zone (indoor growing time plus outdoor frost-free days). This has a calculator to find out your frost dates. And, always choose plants that excite you. Grow what you love! It makes the whole process more fun.